Temple Isaiah held its first service in 1965 at the Suffolk Museum (now the Museums at Stony Brook). Soon thereafter, services were moved to the Stony Brook Community Church where we remained for two years. During that time, the first Sefer Torah was given to the Temple. Student Rabbi Ira Youdovin (a classmate of Rabbi Fisher) served the congregation. 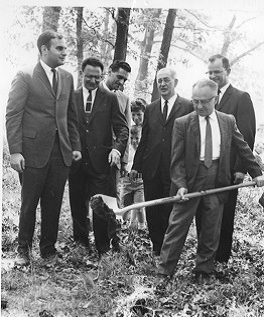 In June, 1967, ground was broken for our first building (now the school building). It was expanded a few years later. From 1969 to 1971, Rabbi Gordon Geller served as the first full-time Rabbi. Rabbi Fisher came in August 1971. In May 1976, the main sanctuary/social hall was dedicated, and in 1984, our third Sefer Torah was purchased. In the beginning of 1986, the new school wing was completed. Rabbi Fisher retired and became our Rabbi Emeritus in 2002 and Rabbi Stephen Karol joined us. Rabbi Karol retired in 2014 and became our second Rabbi Emeritus. Rabbi Sharon L. Sobel became our Rabbi in July of 2014. Rabbi Paul Sidlofsky became our Rabbi in July of 2018. In honor of Rabbi Fisher’s contribution to our synagogue, construction on the Rabbi Adam D. Fisher Library began in 2007. Also in 1967, the Temple acquired the Holocaust Memorial Torah, which originally came from Czechoslovakia. This scroll was recently honored at the first ever New York Gathering of the Scrolls from Czechoslovakia that survived the Holocaust, in partnership with Memorial Scrolls Trust of London. 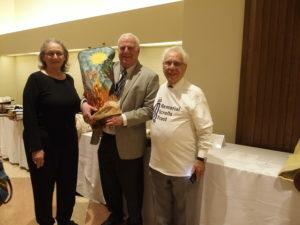 The gathering took place on February 5th, 2019 at The Temple Emanu-El Streiker Center in New York, NY.